Science Box: Why using yeast for research? Well, actually there is much more behind a simple yeast. This has been an organism that is been used in biomedical research for decades already. Why? It's simple: it's a simple organism that is easier to work with than other organisms. Yeast are the simplest eucariotic organisms. They are unicellular (they are just one cell and don't form more complex organs) and have many of the proteins that can be found in human cells. These proteins are in charge of the functions that a cell need to be alive (like workers in a factory). Related to this, yeast can be used to study processes happening in human cells. This is due to the fact that the important proteins are the same in both kind of cells but they are "more accessible" to study in yeast. 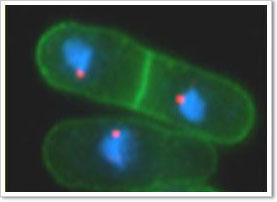 For instance, yeast are used in the study of some of the processes involved in the development of cancer (cancer cells divide without any control and this cell division is studied in yeast). On the other hand, the drugs against fungi and yeast are not very efficient because of this similarity between yeast and human cells. Fungi infections are not severe in general but they can turn into lethal ones when the patients who got them have a deficient immune system (i.e: lymphomas, AIDS,...). And they turn into lethal ones because the immune system can't fight the infection and the anti fungi drugs have two main problems: 1) they are not specific enough against fungi cells so the drug will kill not only the fungal cell but also the human one causing severe side effects 2) to not cause side effects the drug is not potent enough to kill the fungi. So studying the different structures between yeast/fungi and human cells (i.e: the cell wall) is required to develop new drugs against fungi. I hope I've convinced you that doing research with yeast is useful and important. I will keep talking about some discoveries made in yeast that have been important steps to advance in the scientific knowledge in my next posts.